Das Ergebnis dieser Arbeit zeigt, dass Web 2.0 Tools viele Möglichkeiten zur Kundenbindung bieten und besonders die zwei Anwendungen Facebook und Twitter können dafür eingesetzt werden. Dennoch birgt der Einsatz von Web 2.0 Tools in der Marketing Strategie auch immer Gefahren, besonders wenn diese nicht richtig verwendet werden. Am Beispiel von Firmenseiten auf der Social Network Plattform Facebook, sieht man, dass bei falscher Nutzung keine Kohärenz des dort veröffentlichten Inhalts mit dem allgemeinen Firmenimage besteht. Des Weiteren können User sich als Opfer von unerwünschter Werbung fühlen und negative Gefühle gegenüber einem Unternehmen entwickeln. Nichtsdestotrotz bieten Web 2.0 Tools zukunftsorientierten Unternehmen, die wettbewerbsfähig bleiben wollen, großartige Möglichkeiten, wie zum Beispiel aktive Kommunikation mit Kunden, Segmentierung und Zielgruppendefinition, Vertrauens und Akzeptanzförderung, Aufbau von Begeisterung und Emotionen, sowie Erkennen von Trends und Sammeln von Kundendaten. Eine Wertsteigerung für das Unternehmen im Sinne von gesteigerter Brand Awareness, Kundenzufriedenheit, Kundenloyalität, und daraus resultierend, erhöhte Kundenbindung, kann dadurch entstehen. In einem ersten Schritt wird der Begriff Web 2.0 definiert und beliebte Web 2.0 Tools werden beschrieben und mit praktischen Beispielen ergänzt um die Verständlichkeit des Themas zu erleichtern. Der zweite Teil dieser Arbeit grenzt den Begriff Kundenbindung ein, listet Möglichkeiten und Gefahren auf und beschreibt des Weiteren das Kundenbindungsmanagement. Als letzter Schritt dieser Arbeit werden die zuvor beschriebenen Web 2.0 Tools auf ihre Einsetzbarkeit im Bereich der Kundenbindung analysiert. Der ausführlichste Teil in diesem Schritt beinhaltet den Vergleich der zwei Web 2.0 Anwendungen Facebook und Twitter hinsichtlich ihrer Eignung im Einsatz von verschiedenen zuvor definierten Prozessen der einzelnen Phasen der Kundenbindung. Diese zwei Anwendungen wurden auf Grund ihrer Aktualität und, zur Zeit der Abfassung dieser Arbeit vorhandenen, Beliebtheit gewählt. The outcome of this paper shows that Web 2.0 tools offer many possibilities in order to retain customers and especially the two applications Facebook and Twitter can be used therefor. However, by implementing Web 2.0 tools into a company’s marketing strategy also problems can occur, especially if not used with sufficient knowledge. Looking at the example of the social network platform Facebook, one can see that the wrong utilization of corporate pages can lead to inconsistency of the published information and the general company image. Furthermore, since this thesis are only conducted by researching literature and professional articles from the internet, applicability is limited to theory and no practical examples are used. Additionally there is no specification for the different industries and market sectors in which the companies operate in, but the entire thesis is conducted with regards to general applicability of findings. The practical treatment of this topic was not manageable for this short period of research and was furthermore neglected due to a lack of contacts to experts in the respective field. This thesis was conducted through research in literature in the fields of Web 2.0, customer retention, customer relationship management and marketing including English and German books and documents. The information was mainly searched for online or in the IMC library focusing on the keywords aforesaid. Due to the huge amount of literature especially in the field of customer retention, theories and strategies stated in books are sometimes contradictory. During the research process several books and online documents considered as useful for the conduction of this thesis, were in the end disregarded due to better description available or an inconsistent outcome throughout the writing process. 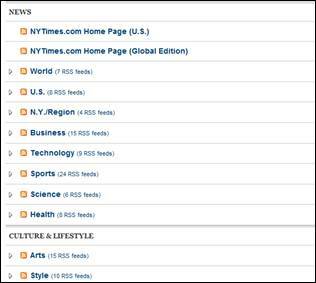 Examples in the sector of Web 2.0 tools were chosen as mentioned in respective literature or according to online articles about recent popularity of applications. 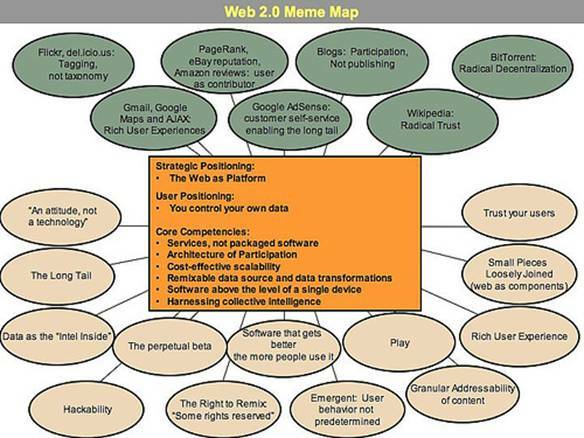 The first part describes the term Web 2.0 in detail and gives general definitions and facts about Web 2.0 including a detailed description of Web 2.0 tools and which possibilities each tool offers (communication, creation of emotions,…). The second part especially concentrates on customer retention and the process of managing customer retention in Customer Relationship Management (CRM). 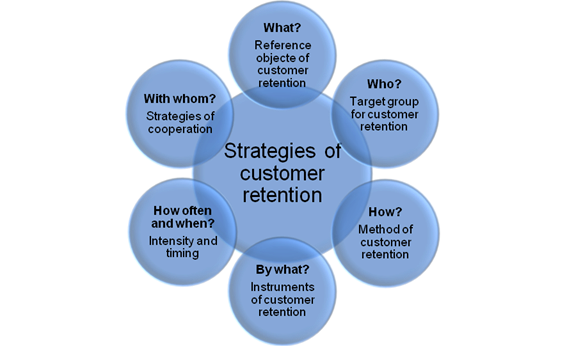 Additionally definitions of terms and importance of customer retention and the management of customer retention are stated. 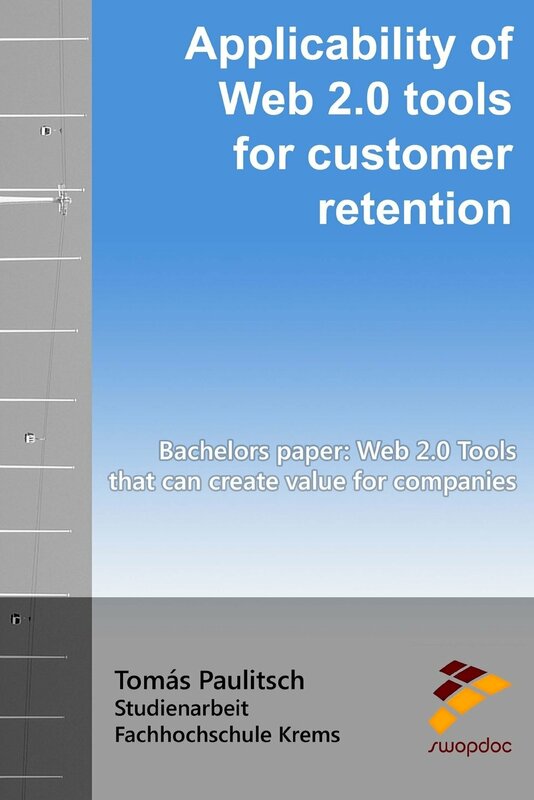 The third part consequently gives some approaches of how to use Web 2.0 for customer retention and furthermore evaluates the Web 2.0 tools, specified in the first part, according to their usability for activities of customer retention processes, described in the second part. For further comprehension and due to recent events, the two Web 2.0 applications Facebook and Twitter are compared and evaluated upon their adequacy in the different customer retention processes. Defining the term itself and several Web 2.0 tools as well as giving examples of their usage, should give a basic understanding of the topic. 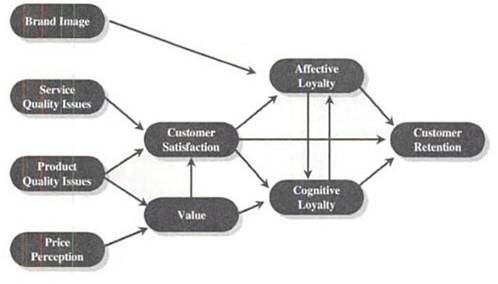 The applicability of the chosen tools for customer retention is thereupon comprehensible and important for the final outcome of this paper. Due to the wide range of tools, which have been defined in the last years, this thesis will concentrate on those, most commonly used and described in books. The emergence of those tools, as well as private usage and business-oriented ways of how to use them for customer retention will be discussed. For further understanding one or more examples will be mentioned for each described tool. The most well-known and most widely discussed Web 2.0 applications are Wikis and Blogs. (Damiani, Lytras, & Ordonez de Pablos, 2009, p. 171) Those two communication forms contribute to the write nature of the Web 2.0 nowadays. (Hagemann, & Voss, 2007, p. 49) Among consumers wikis and video-web pages have the highest popularity, followed by Blogs, photo-web pages and social networks. As shown in graph 1 the usage of Web 2.0 applications of companies widely differs. Podcast, only used by about 7% of internet users in Germany, but more popular in the US, is highly utilized among the “Best Global Brands 2007”, with over 70%, followed by video and photo-platforms with 60%. 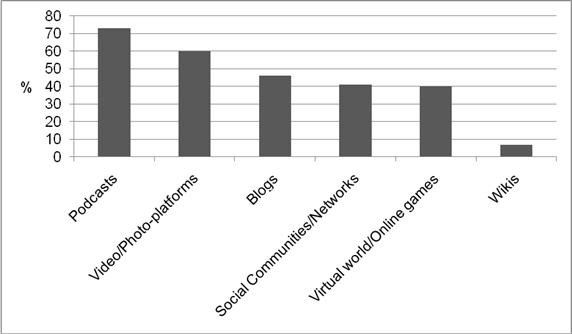 With about 40% blogs, social communities and networks and virtual worlds and online games are listed on the places three to five. Appropriate wiki software allows the user to enter or edit something without using HTML, instead the modified or new content is automatically converted into HTML. (ibid., p. 54) “Wikis should not entrap to passive consummation of information like the conventional Web, but should motivate active exchange of information.” (Back, Gronau, & Tochtermann, 2008, p. 10) Therefore wikis need to be designed as open systems, meaning that each and every user is able to observe and edit all the content. The most popular example for a Wiki is the abovementioned online encyclopedia Wikipedia, which was established in 2001 by Larry Singer and Jimmy Wales. Initially the Wikipedia-project should have amended the already existing Nupedia. Users should write their own contents for an international, free of charge and web-based encyclopedia. By now Nupedia lost its importance and Wikpedia, with versions in over 200 languages and more than 50.000 articles, is the biggest encyclopedia in the world. Today most blogs are much more complex than the basic form of text-based entries. 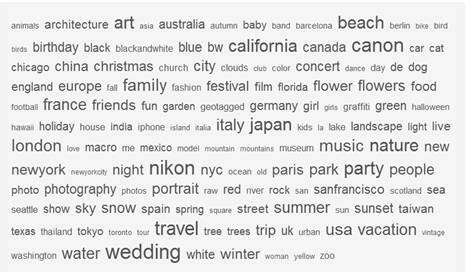 With images, audio or videos, graphics and photos features are added to blogs. (Hagemann, & Voss, 2007, p. 50) Another possibility is to enable comments, which makes a site more interactive through comments and arising discussion and can furthermore create an online community. (Stauffer, 2008, p. 12) One example therefor is the Huffington Post blog, which is, according to Technorati, currently the most popular online blog. According to Dan Connolly from Blogtronix micro-blogging cannot only help to reduce email clutter and increase productivity, but in an interview with Brian Mc Donald on March 1st, 2011, he came up with statistics including top customer and employee engagement benefits of micro-blogging based on experiences of Blogtronix’s customers. Companies experienced an increase of 42% in communication with their customers, 34% higher brand awareness and customer involvement such as feedback and ideas. The first and up-to-now most popular micro-blogging platform is Twitter, which was established in 2006 and, according to statistics used at Hub Spot, in March 2010 reached the 10 billion tweets (micro-blog) mark. Registered users can publish short messages or statements with a maximum of 140 characters, which are followed by other users. Nevertheless about 55% of the 4.5 million user accounts at Twitter have never been used to twitter and another 52.7% of accounts have no followers at all.